If you choose the Report Message button on the ribbon, you'll see several different options. If you choose Junk, Phishing, or Not Junk, you'll have the option to send a copy of the message to Microsoft, along with your classification of the message. This is optional. To turn off the option to send a copy of the message to Microsoft, choose Options and then follow the steps listed under Report Message add-in options below. Junk email messages are typically referred to as spam. These are messages that you don't want to receive that may be advertising products you don't use or find offensive. If you choose the Junk option, a copy of the message may be sent to Microsoft to help update our spam filters, and the message will be moved from your Inbox to your Junk Email folder. Phishing is the practice of luring you into disclosing personal information, such as bank account numbers and passwords. Often phishing messages look legitimate, but have deceptive links that actually open fake websites. If you select Phishing, a copy of your message may be sent to Microsoft to help update our filters, and the message will be moved from your Inbox to your Junk Email folder. If you know the sender and you're expecting the message, or if you receive a message that's mistakenly marked as junk, you can use the Report Message add-in to mark the message as Not Junk. This will move the message from the Junk Email folder back to your Inbox. 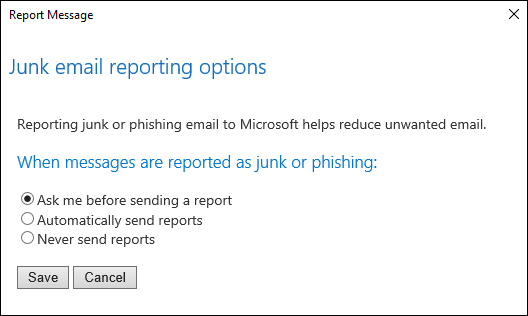 Choosing Options from the Report Message button allows you to choose whether messages are automatically sent to Microsoft when they're reported as junk or phishing attempts. Choose Options from the Report Message button on the Ribbon. Once you've made your selection, choose Save. You'll see the following message in the InfoBar in the message header confirming your changes were saved successfully. Options settings are cached with the message, so in order to see your updated setting, you'll need to select a new message first. If you're using an Exchange server email account, your Exchange administrator may have chosen one of these settings for you. If so, you can't reset the option yourself. If your version of Outlook doesn't support the Options setting, you'll see a notification message that directs you to https://aka.ms/ReportMessageOptions. You can remove the Report Message add-in from the Outlook Add-ins store. Choose the Store button on the Outlook ribbon. Scroll to the Report Message add-in and either disable it or uninstall it. We'd like to know what you think about the Report Message add-in. Choose Yes or No at the bottom of the page to let us know if the Report Message add-in was helpful, and leave us a comment about what you liked and how we can improve.